TCBES Symposium Student Awards in UH News! Dominique Zarders TCBES M.S. Thesis Defense! Eszter Collier TCBES M.S. Thesis Defense! Shea Uehana TCBES M.S. Thesis Defense! Kailey Pascoe TCBES M.S. Thesis Defense! Joanna Norton TCBES M.S. Thesis Defense! CJ Kow TCBES M.S. Internship Defense! Marty Kawasaki TCBES M.S. Thesis Defense! Gina McGuire TCBES M.S. Internship Defense! Jeff Stallman TCBES M.S. Thesis Defense! Students Karen Gallardo, Ashley Pugh, and Megan Hillery organized a successful, first-ever Women in STEM conference at UH Hilo! Check out the article featuring the 11th Annual TCBES Research Symposium and the student award winners in the University of Hawaiʻi News. Please join us to learn and discuss investigations of host-shift behaviors of an interesting insect exhibiting a rare instance of using native hawaiian and non-native plants as its food and habitat source during Dominique Zarders thesis defense on Monday, April 15th at 2:00pm in Wentworth 1. Understanding the causes of non-target host attacks by biological control agents is essential for improving the predictive power of host-specificity testing for insects. Testing host shifts can be challenging when rare instances of non-target attacks occur. The investigation of genetic variation within the agent species, paired with feeding and reproduction bioassays of the agent on potential host plants can provide a better understanding of control agent host-specificity. This is especially important when control agents display rare behaviors of attacking a new host species distantly related to the original host. Teleonemia scrupulosa (lantana lace bug) was first introduced to the Hawaiian Islands in 1902 as a biological control agent for the invasive plant, Lantana camara (lantana) and helped successfully control lantana throughout the Hawaiian Islands. Years later, T. scrupulosa was reported targeting a distantly related endemic plant species, Myoporum stellatum, in the absence of lantana. To better understand this rare case of non-target attack, insect-plant host bioassays and an investigation of intraspecific genetic variation using three different T. scrupulosa populations from two Islands were conducted. Results show slight mtDNA variation within one T. scrupulosa population on Hawaiʻi Island, but overall no statistically significant variation among the three populations. Bioassay results of host plant suitability indicate the Oʻahu population is more adapted to utilize not only M. stellatum but also M. sandwicense. The overall fecundity was higher on the Myoporum species among the Oʻahu population when compared to the West Hawaiʻi population. The W. Hawaiʻi population was more successful on lantana than the Myoporum species but was still able to utilize the purported non-hosts. However, the W. Hawaiʻi and the Oʻahu populations’ fecundity were statistically the same when compared on lantana. This knowledge will aid in the determination if the host shift within the T. scrupulosa population on Oʻahu is a co-adaptive trait developed after being introduced allowing certain T. scrupulosa populations to utilize other plants in the region of origin, hence leading to higher likelihood of host shifts in new localities. Eszter Collier will present her Thesis Defense Seminar on Wednesday, April 10th at 9:00am in the Mookini library, 2nd floor CyberCANOE (LRC350) as part of the Tropical Conservation Biology and Environmental Science Program (TCBES). Historical land use patterns across Hawai’i have created degraded dryland ecosystems that are at high risk for erosion. An unfortunate example of this is the Kawaihae watershed, a semi-arid landscape prone to erosion located in leeward Kohala on Hawai’i island, where offshore deposition of eroded sediments have detrimentally affected coastal marine ecosystems by decreasing habitat quality and burying important cultural sites. Due to the extensive and persistent effects of erosion, it is important to look for non-traditional agents that may help to hold sediments in place. Biological soil crusts are communities of photosynthetic microorganisms that grow over bare soil in arid and semi-arid ecosystems and are known to increase soil stability. Despite their potential to mitigate erosion, the distribution of biocrusts in degraded drylands on Hawaii Island is unknown. We mapped biocrusts in the Kawaihae watershed using imagery collected by small unmanned aerial systems (sUAS) at three spatial resolutions (1.15, 2.05 and 2.80 cm/pixel). Using a pixel-based methodology, we produced classification maps with overall accuracies ≥85% at all three resolutions. As biocrust development is associated with increasing soil stability, we also explored this relationship in the Kawaihae watershed. We identified 3 different biocrust levels of development (LOD) and conducted soil aggregate stability testing at all development levels. We found that there is a significant increase in soil stability between soils without surface biocrusts (LOD score of 0) and those with biocrusts at any development level (LOD 1-3). Higher-developed biocrusts imparted greater soil stability than less-developed biocrusts, but the impact on soil stability reached a ceiling beyond biocrust LOD 1. In addition, we applied our mapping methodology to investigate the direct impacts of biocrusts on soil loss. We overlaid our classified maps with digital surface models (DSMs) from data sets covering a 2.75-year time span and found intriguing trends of varying soil loss between biocrust and bare soil areas, but more work is needed to verify these results. We also explored the effects of grazing animals on biocrust cover by comparing classified images of a grazed site and a grazing-exclusion site. Our biocrust mapping methodology can be used by researchers and land managers globally and provides insight into the role of biocrusts in erosion prevention in the Kawaihae watershed and similar arid/semi-arid landscapes. TCBES graduate student Shea Uehana will present his Master's Thesis defense this Tuesday, April 9th at 1pm in W14. In order to better understand and predict the future effects of global climate change, researchers must utilize methods that allow accurate interpretation of pre-instrumental environmental conditions. Dendrochronology is especially useful because of its ability to utilize climate proxies spanning tremendous spatial and temporal scales in the form of tree rings. The construction of a global network of tree-ring chronologies is already well underway, but temperate bias has resulted in an underrepresentation of the tropics. The Hawaiian Archipelago provides a unique opportunity to gather tree ring data from an undersampled region of the eastern tropics. We used classical dendrochronological methods to expand on previous research on Hawaiʻi Island, adding trees from an additional site, Puʻu La‘au, and extending the tree-ring chronology for māmane (Sophora chrysophylla) from 86 years to 173 years. We also investigated the dendroclimatic potential of our longer chronology and found that older māmane trees at Pu’u La’au do not appear to exhibit a strong enough growth-climate relationship to be utilized for climate reconstruction. TCBES graduate student Kailey Pascoe will present her M.S. thesis defense on Tuesday April 9th at 3pm in Wentworth 1. Her presentation will also be streamed live on TCBES Facebook Page. Title: Coral reef community structure and demographics act as drivers of partial mortality in corals throughout the Papahānaumokuākea Marine National Monument. Understanding the association between coral community demographics and coral health is critical in the face of increasing environmental stressors driven by an ever-expanding human population. Within the last several decades, reefs around the globe have seen substantial increases in levels of coral disease as well as large-scale outbreaks and mortality. Corals are constantly experiencing partial mortality lesions, fusion, and fission. These conditions are affected by demographics, environment, competition, reduced health, disease, and natural disturbances. Corals exhibit highly variable levels of partial mortality, which is a useful indicator of overall coral health, thus it is important to identify drivers of this condition. This study examines monitoring data on coral health and disease from surveys (n= 4449) conducted throughout the Papahānaumokuākea Marine National Monument (PMNM) for the Reef Assessment and Monitoring Program. Linear mixed-effects models were used to identify characteristics of coral community structure and demographic parameters that were associated with partial mortality of corals. A significant latitudinal gradient was evident in both coral demographic parameters as well as partial mortality, with high latitude atolls exhibiting the lowest mean values in coral size, density, diversity and the highest mean values for partial mortality. The results from the linear mixed-effects models showed coral partial mortality is predicted by the size of individual colonies (0.02±0.26(S.D. )), density (-0.33±0.07(S.D. )), species diversity (-0.03±0.01(S.D. )), and colony morphology. Colony size showed a strong positive relationship with partial mortality, whereas density and diversity showed slightly negative relationships with partial mortality. Branching and mounding morphologies exhibited the strongest effect on coral partial mortality. These comprehensive statistical analyses provide useful insight into understanding the dynamics of coral health throughout the PMNM. Identifying characteristics of coral colonies and communities that are susceptible to reduced health and disease plays an important role in enabling scientists and managers to predict how reefs will adapt and change in the face of increasing environmental stressors. Joanna Norton will present her Thesis Defense Seminar on Monday, April 15th at 1pm in Wentworth 9 as part of the Tropical Conservation Biology and Environmental Science Program (TCBES). TITLE: Can Compost from a Nitrogen-Fixing Tree, Falcataria moluccana, replace chemical fertilizer and store carbon in agricultural systems? The challenges of food production, invasive species control, and climate change are intersecting, as they all stem from our ongoing use of land and energy on a global scale. In east Hawaiʻi, two problems involving these issues are reflective of global trends. First, an expansion of agriculture is needed here, yet crop lands are typically depleted from prior farming and demand fertilizer inputs that are environmentally costly. Second, the invasive, nitrogen-fixing tree albizia (Falcataria moluccana) is dominating landscapes and altering ecosystems with rapid cycling carbon and nitrogen inputs.,These two trends are predicted to intensify with climate change. Yet each of these problems could hold a remedy for the other problem,using practices described in the new field of climate-smart agriculture (CSA). Hawaiʻi Island presents a unique opportunity to test if accumulated nutrients from albizia growth can benefit agricultural systems lacking in fertility, due to the intensity and grave consequences of the albizia invasion, as well as the underutilization of agricultural land and lack of food self-sufficiency in Hawai‘i. This study examines whether compost from albizia can replace chemical fertilizer and store carbon in agricultural lands in East Hawai‘i. Trials were conducted over one growing season, including two crops, corn and cassava, and 4 replicates across a spectrum of East Hawai‘i farmland sites representative of varying soil conditions and land use history. Treatments included a control, a typical application of chemical fertilizer (1N nitrogen applied), two levels of albizia compost (1N and 2N levels of nitrogen applied), and two levels of combinations of chemical fertilizer and compost (1N and 2N). Harvest yield results showed that the albizia compost was not an adequate replacement for chemical fertilizer in the corn crops. In the cassava crops, albizia compost produced yields equal to chemical fertilizer. Variation among locations and within locations was larger than variation due to treatment in the cassava trial, but results suggest that the compost application was more effective on more degraded farm sites. Economic and carbon costs associated with the chemical fertilizer and albizia compost were generally not different across treatments, and a partial analysis of carbon gained or lost was also similar across treatments. The results of these field trials show that CSA using albizia compost can be a viable and equivalent method to chemical fertilizer, depending on characteristics of the site and the crop species. TCBES graduate student CJ Kow will present his M.S. internship on Monday, April 8th at 9am in UCB 127. Students in the Hawaiian K-12 school system have consistently scored below the national average for proficiency in science. The Department of Education has implemented new “Next Generation Science Standards” for the 2019-2020 school year to increase the statewide average scores in science proficiency. With an emphasis on informal science, many educators are looking for resources that can help to improve the ability of their students to understand complex science topic. This study was conducted at a local science center, Mokupāpapa Discovery Center, to determine if visitor demographics are statistically associated with time spent at science exhibits. Visitors were observed over a two-month period, and observational data was collected and analyzed to determine if the ‘total time’ spent at each exhibit varied significantly based on the age or gender of the visitors. This study found statistically significant associations among the amount of time spent at various exhibits and visitor demographics. The most popular exhibits identified by this study were used to create a set of criteria, known as LASTING, that can be applied to other exhibits to increase total visitor time and target larger audiences. The overall goal of this project is to help cultivate scientific outreach exhibits to enhance STEM educational opportunities for K-12 students in Hawaiʻi. TCBES graduate student Marty Kawasaki will present her Master's Thesis defense this coming Thursday, April 4th at 2PM in STB 118. See below for more info! Title: "The urbanization of the Hawaiian stilt: Meeting the new neighbors"
The unique geography of Hawaiian wetlands on older islands create isolated habitats that have been degraded by the increase of western anthropogenic effects, leading to an overall reduction in functional waterbird habitat. The critically endangered Aeʻo or Hawaiian stilt, Himantopus mexicanus knudseni, navigates the heterogeneous landscape surrounding Hawaiian wetlands. Hawaiian stilt populations have been slowly recovering since the 1900s when numbers were devastated. Previous observational studies on Hawaiian stilt have demonstrated them to be a highly mobile species making them difficult to track across urban environment. The uses of GPS solar satellite tracking devices have offered a glimpse into the dynamic habitat uses of Hawaiian stilt. Over a six month period four Hawaiian stilts were fitted with GPS solar satellite trackers, their individual and daily movements were summarized by the habitat types they visited. 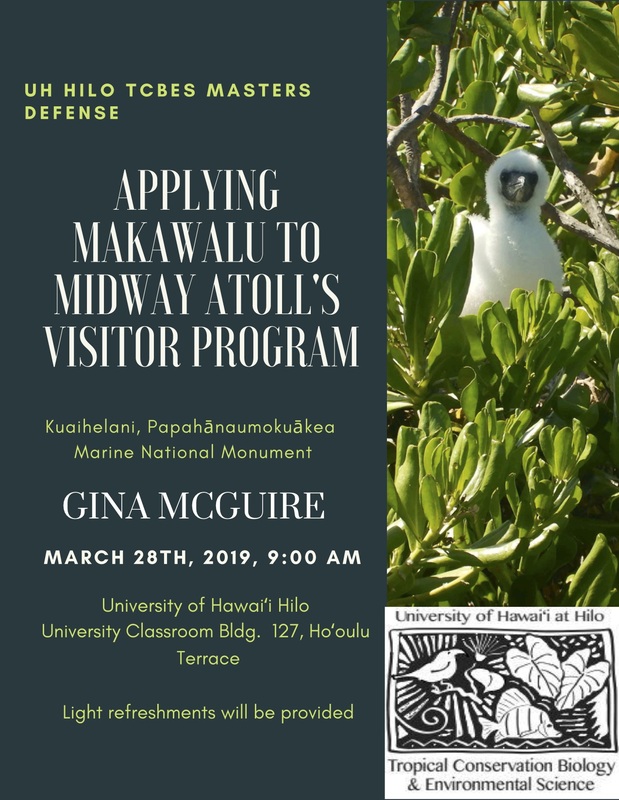 I will discuss the highly variable movements I observed between individuals, and daily habitat use shifts from water dominated habitats to the more urban developed areas of Oʻahu. Join us for TCBES M.S. candidate Gina McGuire's internship presentation on Thursday, March 28th at 9am, in UCB 127. An interdisciplinary group of researchers from the University of Hawaiʻi teamed up with colleagues from other universities and several Native Hawaiian communities to compile conservation findings in a special issue of Sustainability that will be the largest collection of scientific publications made by Native Hawaiians. The group’s work focuses on biocultural restoration in Hawaiʻi. Read the full article on the University of Hawaiʻi News webiste. On February 12th, the inaugural Women in STEM conference was held on the UH Hilo campus to discuss the current state of affairs for women in the fields of science, technology, engineering and math (STEM). The conference was sponsored by the UH Hilo Women’s Center, TCBES MATERS Club and the Office of Equal Opportunity and Affirmative Action. To learn more about this great success, read the article and enjoy the pictures of the speakers and the opening ceremony! Read the article and watch the video to learn more about how UH Hilo graduate student, Jared Nishimoto, and undergraduates under the supervision of Dr. Jolene Sutton are developing genetic technologies that will help control invasive mosquitoes in Hawaiʻi. CURE (Course-based Undergraduate Research Experiences) have proven effective for a wide-variety of student learning objectives and Matt Knope, along with his collaborators at Arizona State, are investigating which model of scientific inquiry results in better outcomes for students. Read the full article for more information. 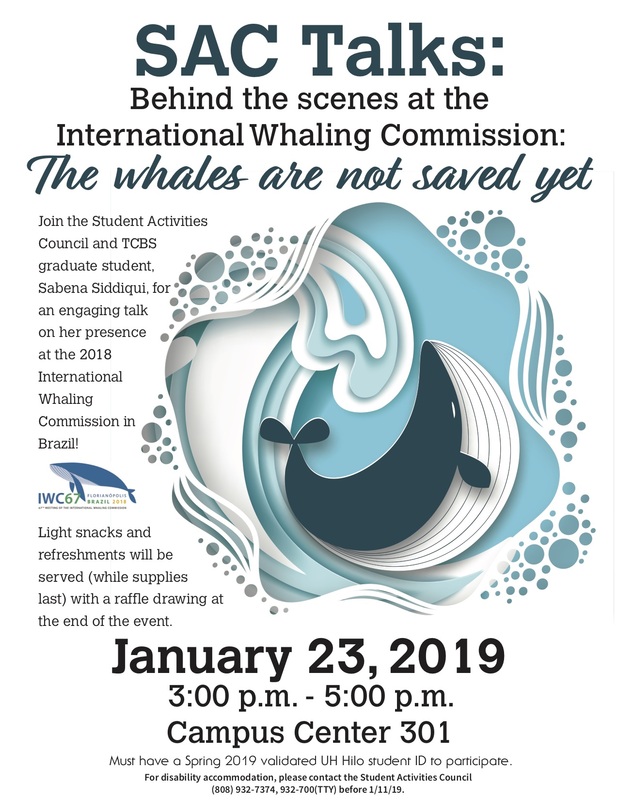 Graduate student Sabena Siddiqui will be giving a campus wide talk on a "First-Hand Behind the Scenes" account of the 2018 International Whaling Commission meeting in Brazil, January 23 from 3-5 PM in Campus Center Room 301. Light snacks and refreshments will be served with a raffle drawing at the end of the event. Special Restrictions: Must have a valid Spring 2019 UH Hilo ID. For more information, please see the attached flyer or contact: uhhsac@hawaii.edu, (808) 932-7374. 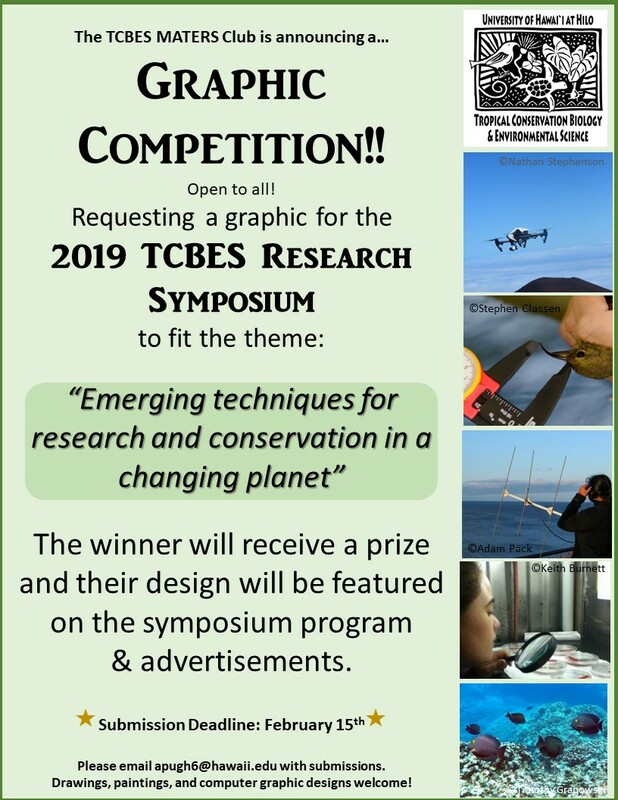 We're holding a graphic contest for this year's TCBES Research Symposium! The winner will have their artwork featured on the programs and advertisements, as well as win a prize! Anyone is welcome to submit their art by the deadline Feb. 15th, 2019. See the flyer for more details.